(MPI) - On November 19th, 2018, at the headquarters of the Ministry of Planning and Investment, Minister Nguyen Chi Dung worked with the business delegation of the state of Saxony led by State Minister for Economy, Labor and Traffic and Deputy Minister President of Saxony, Federal Republic of Germany Martin Dulig visiting and working in Vietnam. Minister Nguyen Chi Dung and Minister Martin Dulig at the meeting. Speaking at the meeting, Minister Martin Dulig thanked Minister Nguyen Chi Dung for taking his time to welcome and work with the delegation and stated that the purpose of the delegation's business trip is to learn more about the country and people of Vietnam, through that contribute to tightening the cooperation relationship between Vietnam and Germany. With a strongly growing economy, Vietnam has favorable conditions in continuing its sustainable growth. To achieve this goal, Vietnam needs influential partners and the Federal Republic of Germany in general and Saxony state, in particular, are ready for this role. The state of Saxony has strength in fields of machine manufacture, automobile industry and is looking forward to contributing positively to the prosperity development of Vietnam, Miniter Martin Dulig emphasized. At the meeting, representatives of Saxony’s enterprises in the fields of automobile supporting industry, railway safety technical systems solutions, cold technology in food preservation, textiles and machine manufacturing, cable producing, etc., introduced their business sector and expressed desires to seek investment and business opportunities in Vietnam. Welcoming Minister Martin Dulig and the members of the delegation to visit and work in Vietnam, Minister Nguyen Chi Dung said that the exchanged, shared information had expressed their interest in the investment, business environment of Vietnam, this comes from a long tradition of friendship relationship between the two countries which is now in a very good phase. The Federal Republic of Germany is an important partner of Vietnam in the European region and a major partner in trade and investment to Vietnam. The Government and people of Vietnam always appreciate and are thankful for the German Government's support through ODA and non-refundable aid. The German Government's support to Vietnam is not only by resources but also by knowledge, valuable experience, technology, and contributions to Vietnam's development process. At present, the two-way trade turnover between Vietnam and Germany is about 10 billion USD. German enterprises’ investment in Vietnam reaches approximately 2 billion USD. However, this result is modest compared to the potential and desires of the two countries. Informing about the investment environment in Vietnam, Minister Nguyen Chi Dung said that Vietnam is developing rapidly with its stature and position elevated highly in the region and the world, a population of nearly 100 million people and a location in the center of ASEAN. Especially, Vietnam is actively integrating itself deeply and widely into the world economy. Vietnam has signed 12 free trade agreements and has become a crucial link of the economic linkage network with 55 countries. Vietnam's National Assembly passed a Resolution approving the Comprehensive and Progressive Agreement for Trans-Pacific Partnership (CPTPP). These are great opportunities for Vietnam to integrate more deeply and widely and a great platform for inviting enterprises to invest in Vietnam, including German enterprises. Vietnam hopes to enhance the cooperation with the Federal Republic of Germany in the industries of automobile, energy, healthcare, education, and training, etc. Regarding automobile industry Vietnam wishes the Saxony state to build a detailed plan to Vietnam regarding this sector. 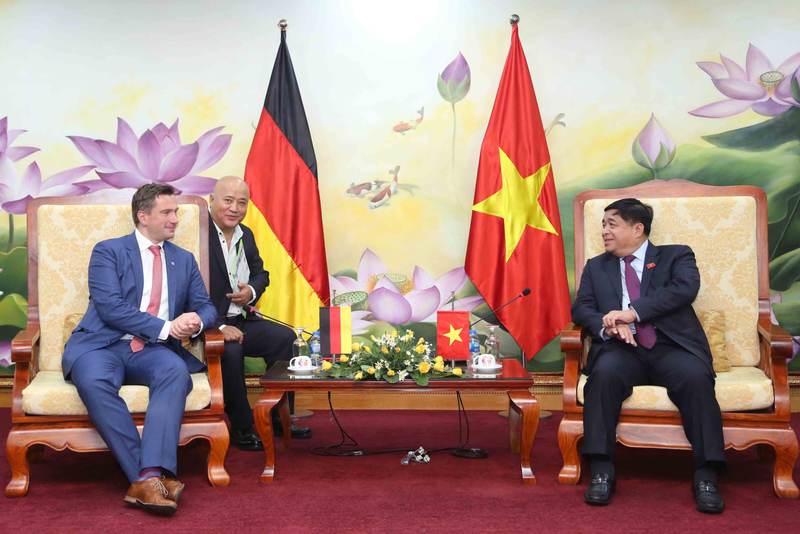 At the same time, Vietnam hopes that the German government in general and the German business community, in particular, continue to accompany the Government of Vietnam in the process of implementing the industrialization and modernization of the country, technology transfer and utilization of the opportunities offered by the 4.0 industry revolution. 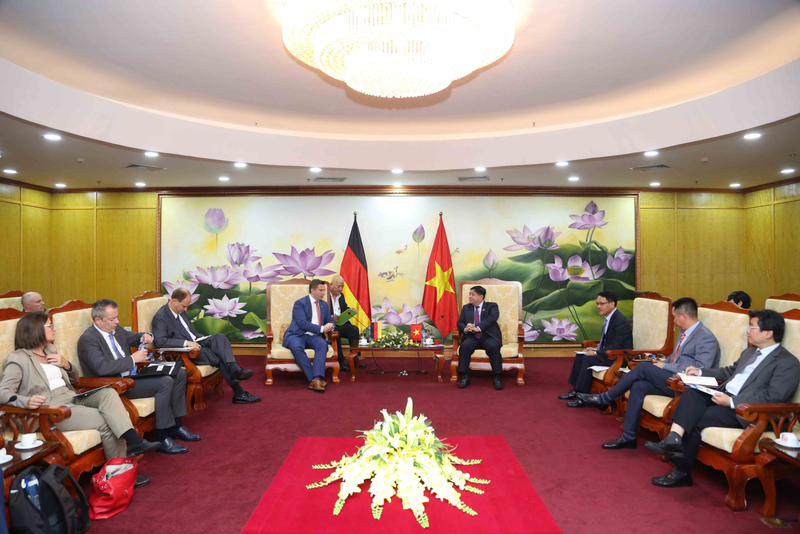 This contributes to making the relationship between Vietnam and the Federal Republic of Germany more and more active, extensive, effective and comprehensive./.